Young and old alike are invited to the Ridley Township Public Library’s annual Peeps Diorama Contest! 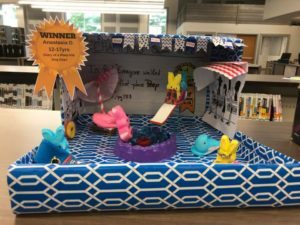 Participants are encouraged to create a diorama of Peeps based on a book of their choice. Anyone can make a shoebox-size diorama to display in the library. Contestants will have the chance to win awesome prizes. One entry per person/age category please! 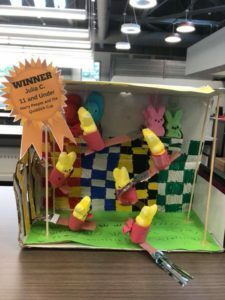 Build a diorama using peeps candy of any color or type in a standard size shoe box. The theme is anything literary; for instance, recreate a scene from your favorite book. All characters must be peeps! Age Categories: 11 and under, 12-17, 18 and over. On the back of your shoe box, please include your name, age (if 17 or younger), phone number, email address, and the title of your “Peeps Show” (example: Jane Smith, Age 10, (610)555- 5555, janesmith@email.com, “Harry Peeper”). Title can be shown on the front of your diorama. Bring your diorama to the library April 22nd-May 5th, 2019. All Peeps dioramas will be displayed in the library for everyone to enjoy and vote on! Entrants agree to permit the Ridley Township Public Library to photograph and submit images in advertising or promotion. Voting for a ‘Peeples Choice’ winner in each age category will take place May 6th-19th, 2019. Winners will be announced May 20th, 2019. Prize winners will be contacted at that time. Peeps should be picked up by Saturday, June 1st. All Peeps not picked up by the deadline will be discarded or eaten! For more information, please call 610-583-0593 or visit our website, www.ridleylibrary.org. For Inspiration check out these great sites! 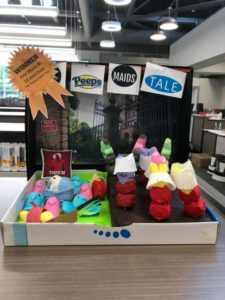 You can also do a Google search of “Peeps Diorama”! Here are last year’s winners!